Check the statistics. There is hardly a race at Woodbine for fillies and mares that a Windhaven horse has not won in the past 40 years, ever since the day his filly Sugar Raiser won the Boniface Stakes in 1973. A Windhaven owned horse has captured the elite races for the distaff side – the E.P. Taylor (formerly the Nettie), Canadian Oaks, Natalma, Selene, Mazarine, Tattling, Duchess, Star Shoot, Belle Mahone, Shady Well, Nassau, Canadian, Glorious Song and My Dear Stakes. In 2012, he achieved the ultimate in his industry when he won his first Sovereign Award as Canada’s outstanding breeder, and he did it with just 32 starters that won 20 races and six stakes. While his program did produce one of the leading fillies in the U.S., Grade 1 winner Joyful Victory, Windhaven also bred Uncaptured, the Horse of the Year and champion two-year-old colt. Graham sold him for $290,000 as a yearling to John Oxley. He also bred two colts that vied with Uncaptured for juvenile honors – multiple stakes winner River Seven and Cup and Saucer winner Star Contender. The 2013 season was almost as rewarding for Graham. He bred 20 winners from 29 starters that earned $2.2 million. The season’s highlight was the news that Captivating, dam of Uncaptured, was named Broodmare of the Year. At present Windhaven has 24 broodmares. After foaling here they ship to Windhaven’s 150-acre farm in Lexington, KY to mature. Windhaven’s talented crop of fillies include Sovereign Award winners Wavering Girl, Fantasy Lake, Cotton Carnival, Canadian Oaks’ champion Blondeinamotel and Proud Lou, winner of the Grade 1 Frizette Stakes at Belmont. Graham’s first really outstanding filly was Majestic Kahala. She won the E.P. Taylor, Nassau, Autumn and Duchess and was later sold for $2.5 million. Graham sold one of her off springs, Malaak, for $650,000 at Keeneland. She went to England and won the 1984 Cheshire Oaks at Chester and was favored for the Epsom Oaks. Born in Goderich, ON in 1937, Graham was an outstanding athlete in Brampton, playing football, hockey and lacrosse. He spent three years as a lineman in the CFL for the Toronto Argos, Calgary Stampeders and B.C. Lions before retiring to join his brother Don in the construction business. “We owned a couple of bulldozers and the business took off shortly afterwards.” Graham Bros. is one of Ontario’s largest independent, heavy equipment construction contractors. He is a member of the Brampton Sports Hall of Fame and the Ontario Road Builders Association Hall of Fame. In 1995 he was named Business Person of the Year by the Brampton Board of Trade. 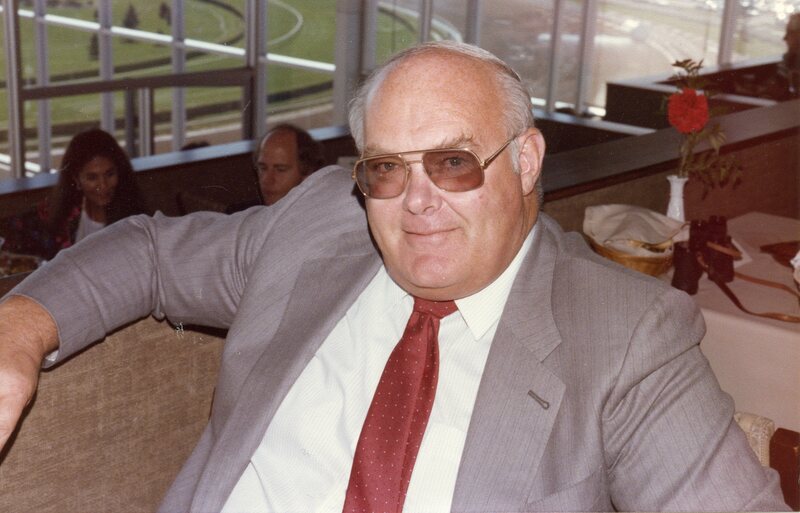 He served as vice-president of the HBPA, a director of the CTHS, a commissioner of the ORC, a Steward of the Jockey Club of Canada and a member of Woodbine’s board of directors. Mr. Graham passed away in January of 2019.